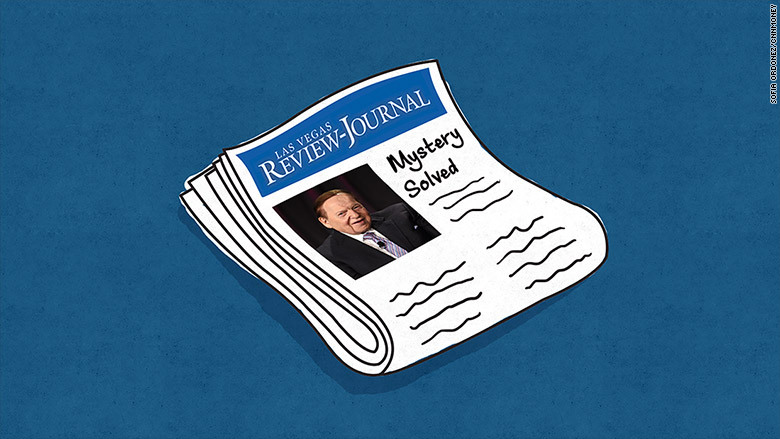 A team of reporters and editors at the Las Vegas Review-Journal solved the mystery of their secret owners. "No matter who owns the Review-Journal, they don't own us." On Wednesday night, against the wishes of its new parent company, a team of reporters and editors at the Las Vegas Review-Journal revealed new information about the company's secretive ownership structure. The story's first sentence is a doozy: "The son-in-law of billionaire casino owner Sheldon Adelson arranged the $140 million purchase of the Las Vegas Review-Journal on Adelson's behalf, sources confirmed Wednesday." The son-in-law's name is Patrick Dumont. When the newspaper called Dumont's wife Sivan, she "hung up before answering a reporter's questions," the paper said. There may be no more awkward position for a newspaper to find itself in: reporting on itself when the owners clearly don't want the reporting. Last week, the newspaper's initial story about the mysterious sale included a quote from the paper's manager Michael Schroeder, who told newsroom staffers that the unnamed new owners "want you to focus on your jobs ... don't worry about who they are." The quote was expunged from a later version of the story. But the staffers remembered what Schroeder said. "Welp, we DID focus on our jobs," Jennifer Robison tweeted Wednesday night. "Bad advice for him." Robison and two other journalists, James DeHaven and Howard Stutz, co-bylined Wednesday's 1,800-word story. Earlier in the day, Fortune magazine identified Adelson as the mystery owner. Then CNNMoney published portions of my conversation with Adelson from Tuesday, when the mogul said he has "no personal interest" in the paper. It was the Review-Journal, at the end of a harrowing day, that definitively sorted everything out. Dumont "put together the deal at the behest of his father-in-law," the reporters wrote, quoting a "source close to the Adelsons" who said Dumont "handles all the investments for the family." Maybe that's what Adelson meant when he said he has "no personal interest." But the Review-Journal also cited "another source familiar with the deal" as saying that Adelson personally "funded the transaction." "Who's our daddy at Las-Vegas Review-Journal? Pull up a chair and have a seat. We're about to tell you." Once it was up, others in the newsroom celebrated. Carol Cling tweeted the sentiment that "no matter who owns the Review-Journal, they don't own us." There was evident pride among the trio's colleagues. Robison posted a picture of her colleagues with a casino chip and the caption "Payday." Journalists at other news organizations also cheered the staff in Vegas. Scott Lucas of the Las Vegas Sun newspaper tweeted that the Review-Journal "reported this against the attempts of their own owners. Hats off to you, folks. Well done." Veteran Nevada reporter Jon Ralston said "this a great day for journalism." And Matt Pearce of the Los Angeles Times said "kudos" to the staff for "refusing to just go along." Earlier, before the paper's big reveal, he had quipped, "Definitely one strong strategy for keeping your identity secret is to hire a building full of reporters." Definitely one strong strategy for keeping your identity secret is to hire a building full of reporters. The Adelson family subsequently confirmed the news in a statement that was printed alongside the story.